Notes: Designed by Jay Fair of Eagle Lake, CA. The fly is categorized as a swimming nymph. It is a very effective attractor for trout, bass, and crappie due to the action of the marabou tail and palmered body. 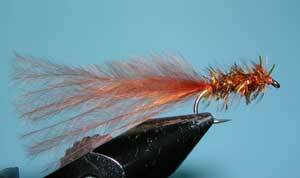 It can be jigged or stripped and works best in stillwater situations. The primary colorations that Jay uses is Olive, Dark Olive, Burnt Orange, and Rust. 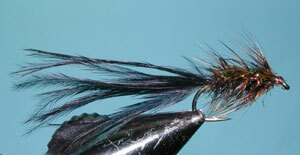 He also uses Black for leeches and White for baitfish. 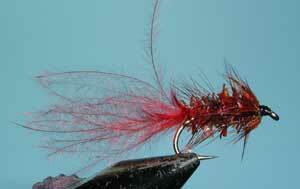 The pattern makes for a very effective Damsel Nymph pattern. Use a Count and Retrieve technique with medium sized pulls and 3-4 second pauses between retrievals. 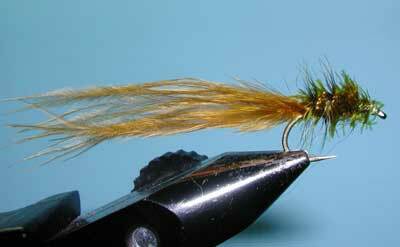 Dyed Grizzly feathers with some webbiness work best for the palmered hackle since the webbiness flows the hackle fibers back over the body. Jay also likes to use a product, he developed, called "Short Shuck". It is a type of crystal chenille that Jay considers very imitative of the natural shuck. 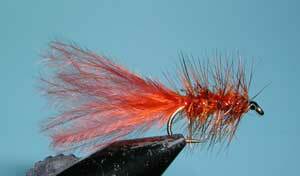 You can get more information on these products at Jay's website: Eagle Fly Fishing.